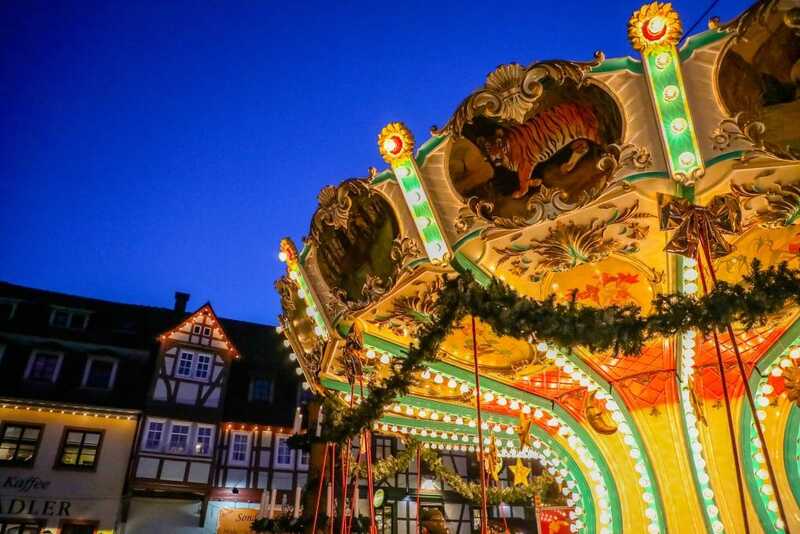 Across Europe, loud, whimsical, glittering Christmas Markets take stage in the center of towns and cities bringing festive cheer. 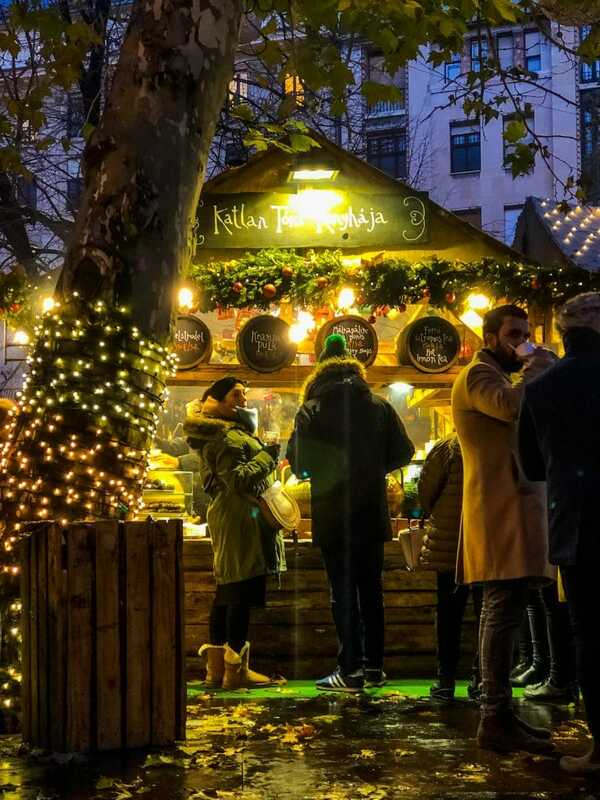 Christmas Markets are a fantastic place to tour and browse trinkets, enjoy an evening with friends and family, get great food, and get into the Christmas spirit! 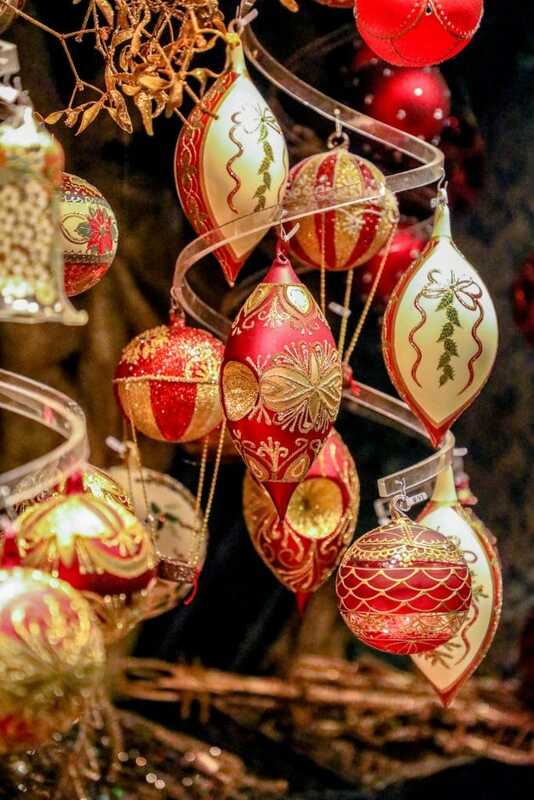 If you’re looking to bring a festive mood to your holiday season, there is no place like a Christmas market! 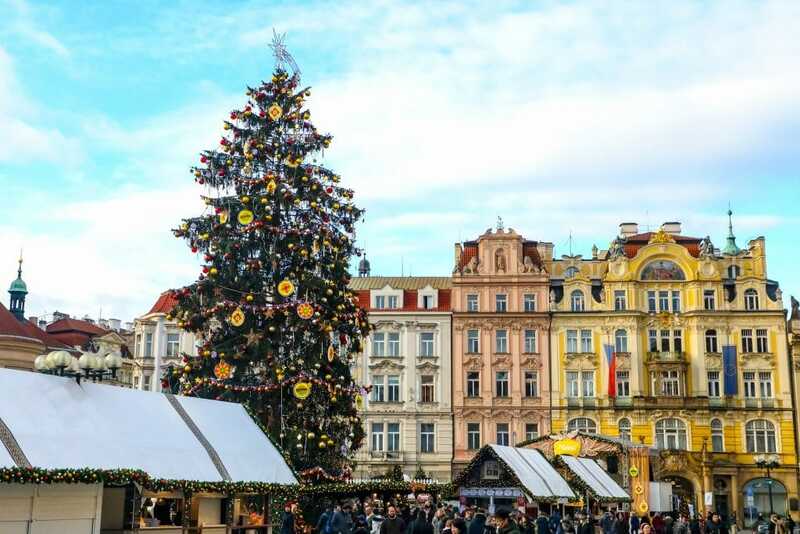 I had no idea how all-out European Christmas markets go in winter – they are truly a magical experience unlike anything in the United States at bringing the holiday cheer. They are packed full of nostalgia, whimsy, and fun – and are incredibly sentimental, even if you’ve never experienced one before! It sounds incredibly cheesy, but I tear up everytime I visit a Christmas market because I love the wonder and whimsy of it so much. They are my favorite way to get ready for the Holiday! Some of the best Christmas light displays you’ll find are at Christmas markets across Europe – tens of thousands of glittery lights dance and twinkle all around. 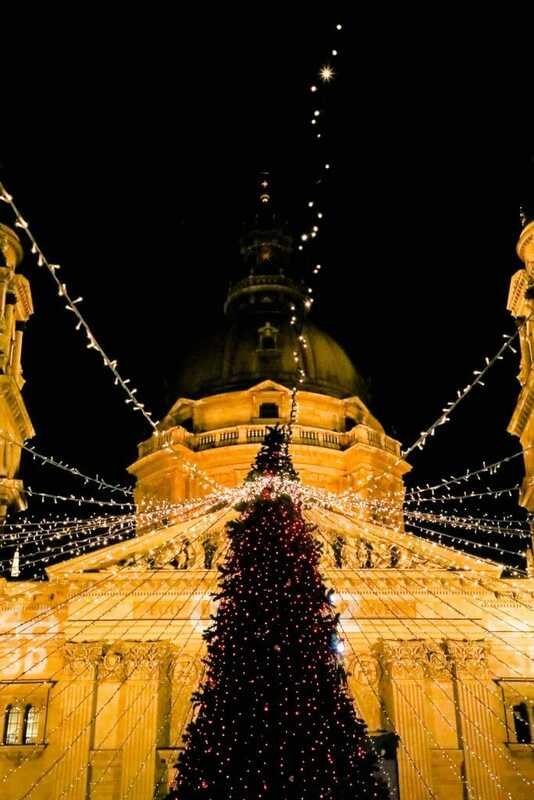 Some markets, like the Basilica Market in Budapest, offer interactive shows and displays, and some have special coordinated light programs. It’s a lovely and festive way to set the mood for holiday market evenings! 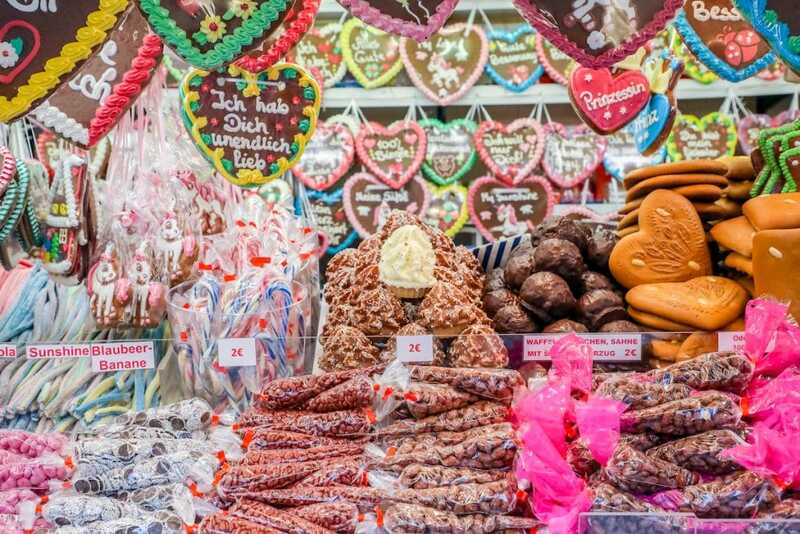 Fire-roasted sausages, giant puffy bretzels (jumbo bready pretzels), hearty soups and stews, roasted chestnuts, potato cakes, and all the treats you could ever imagine – plus indulgent specialties like foie gras, escargot, caviar, and truffles – you can find it at a Christmas market across Europe! 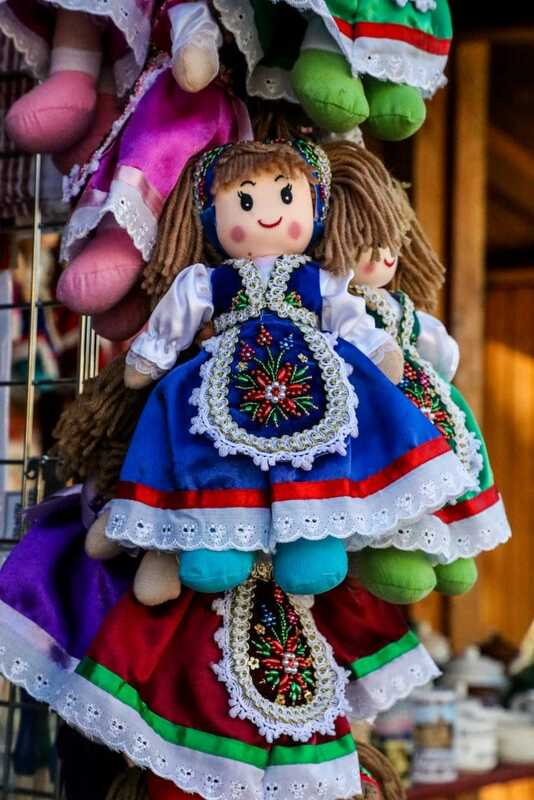 Toys, trinkets, candy, cakes, cookies, clothes, and more – if you’re looking for something special, you can find it for Christmas at a market! Some of the most unique and beautiful decorations I’ve seen are from Christmas markets – some stands have gorgeous buildings that are fully enclosed (which are often quite crowded) to help you warm up from a chilly night outside! 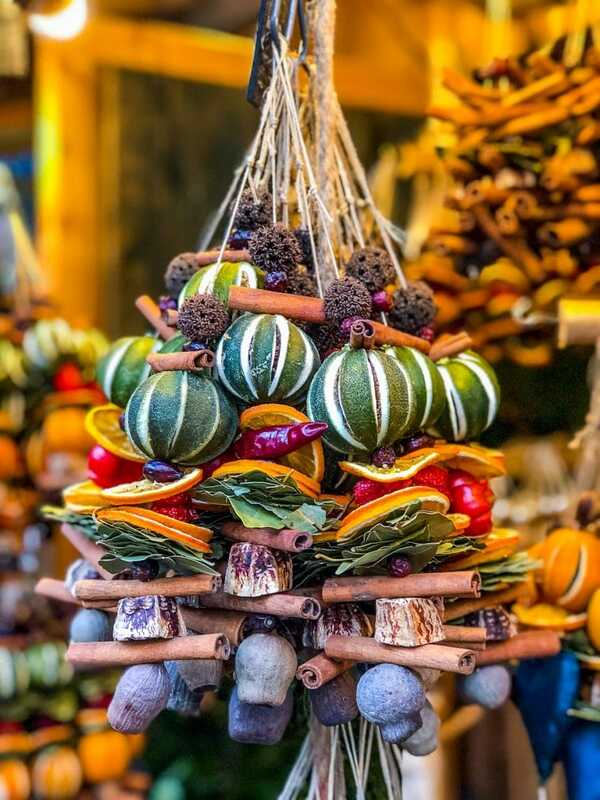 From large trees and outdoor decorations, to anything you need to trim your tree, to bits and baubles to hang around the house, you’re sure to find it at a Christmas market – especially regional traditions like the glass pickle in Germany, or a Krakow Crib in Poland. 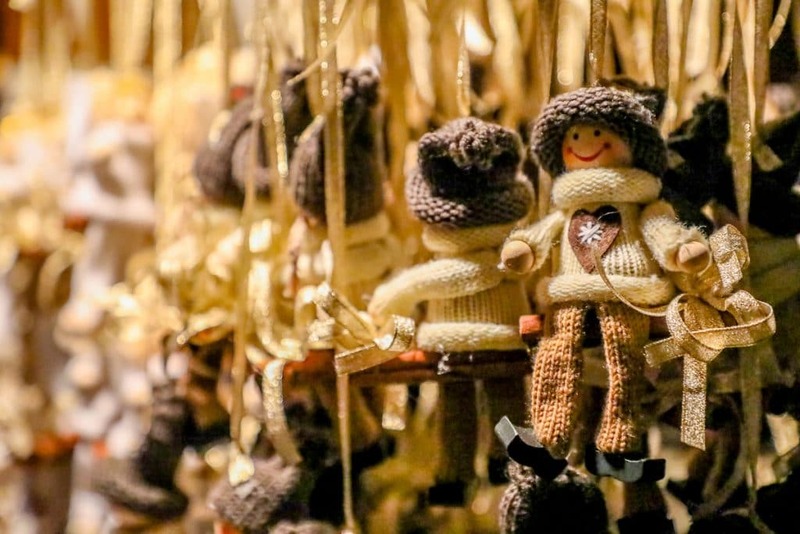 Since most Christmas Markets are outdoors in the wet winter months in Europe, it’s important to stay warm! 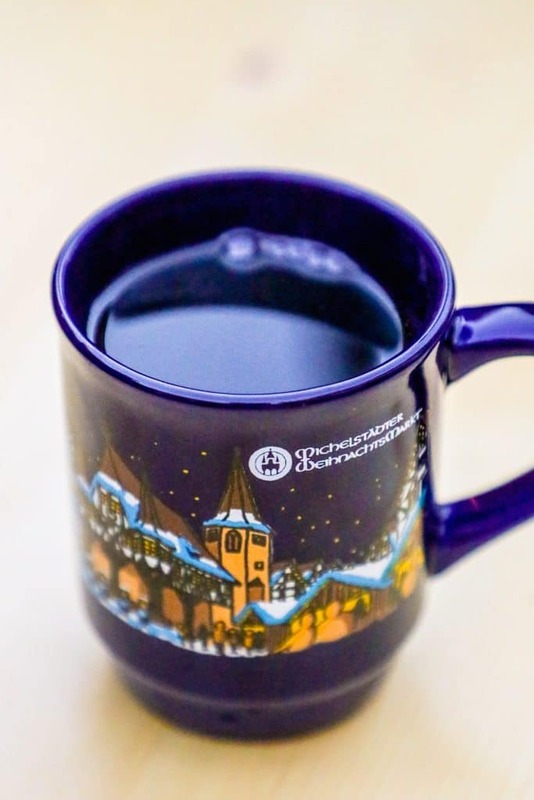 Grab a cozy cup of wassail, gluehwine, slivovica, or even some kinder punsch and let the good times roll! HOT TIP: Many markets have glass mugs for serving their warm drinks- and will charge you to “rent” the mug. When you return it, you’ll receive around the equivalent of two Euros back- though my husband and I have started to collect them as we visit more and more Christmas Markets in Europe. My favorite? The heart shaped handle from Heidelberg Germany’s market. Many markets in large cities have fun elaborate rides in the kids area of a market- from giant Ferris wheels, to swings, gorgeous carousels, and roller coasters (or the slightly more tame kiddie-train coasters) – Christmas Markets aim to be a fun event for the whole family, and often have really fun rides that aren’t expensive. One of my all-time favorite activities isn’t actually a ride, but a giant lifesize snowglobe you can get in and have a snowball fight! It’s a huge blast and a really cool addition to snow-less markets! Many larger town markets have an ice rink for skating – and often with an attached bar to nurse your wounds afterwards! HOT TIP: if you’re kids are inexperienced on skates, never fear! Many rinks have a type of steadier/walkers In the shape of adorable neon animals so they can push it and hold on to stay upright as they skate!! 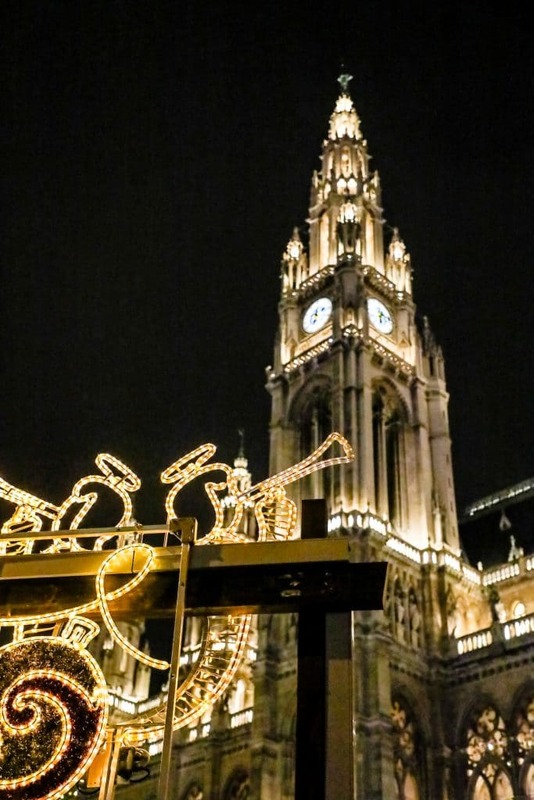 The Vienna Christmas Market at the Rathaus City Hall Square even has an ice skating rink that is a giant track you can skate – making it a market you can ice skate AROUND! It is truly a once-in-a-lifetime experience. 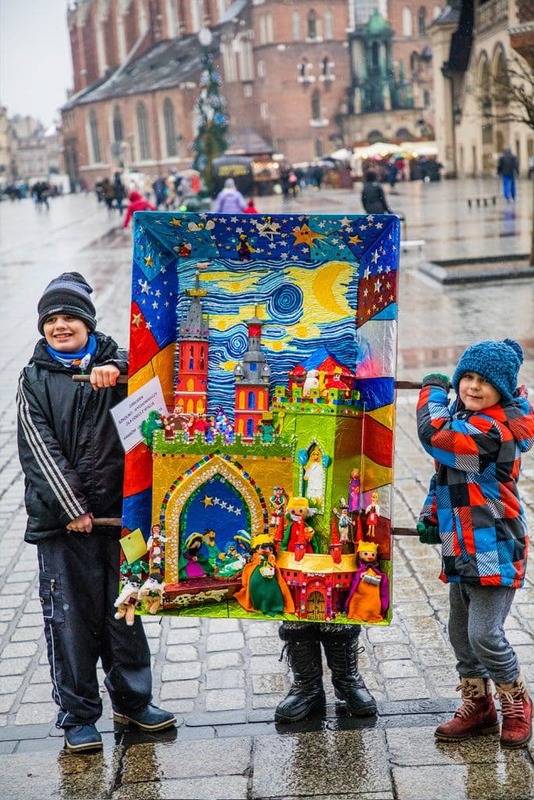 Many markets have carolers strolling through or playing from a stage and loudspeakers, some host small groups to sing and carol, and some don’t have a formal arrangement for carolers. From partying with angels and devils in Prague on the feast of Saint Nicholas; to presenting traditional Polish Christmas “cribs” (a nativity set in Polish landmarks), to greeting trolls or other market mascots – Christmas Markets are a fun way to learn about how different countries and cities celebrate Christmas and incorporate many fun traditions into an evening you won’t experience anywhere else in the world! Before you visit, be sure to look up any special Christmas events and plan your trip around it – you’ll be so glad you did! 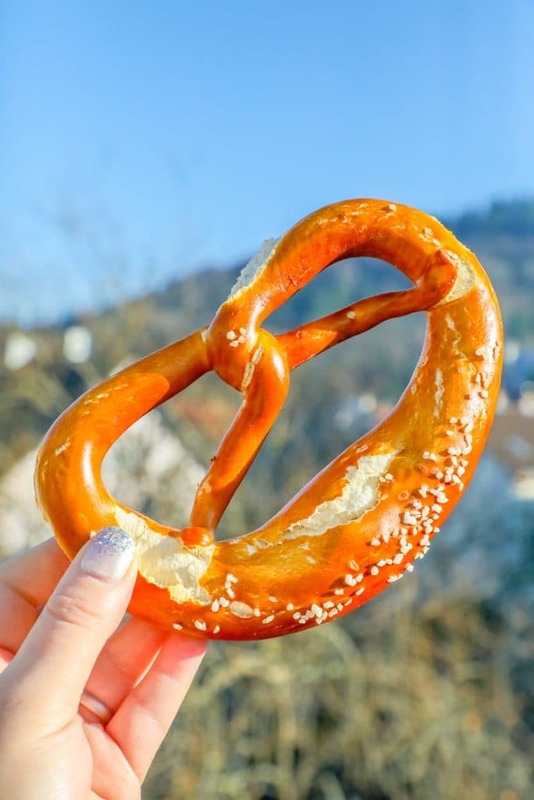 From Rooster Testicle stew and Goulash in Hungary; to bread with pickles, lard, kielbasa, garlic, and onions in Poland; to frankfurters and bretzels in Germany; to Champagne, caviar, and four grad in France – Christmas Markets are a delicious way to sample regional foods in a quick, easy, and comfortable setting. 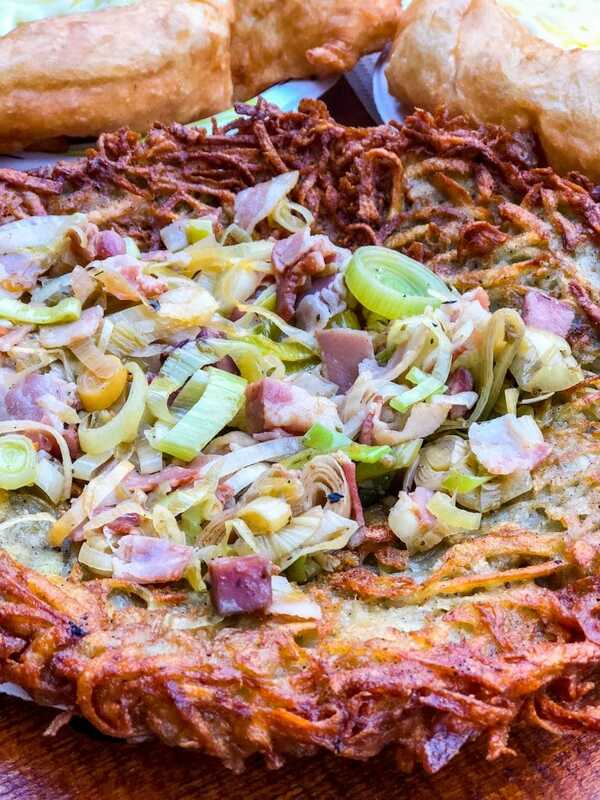 And if you order something you don’t love, you can easily and inexpensively try something else! Some of my favorites are always Chimney cakes – a cylindrical semi-sweet cakes cooked over an open fire – or the ubiquitous Bubble Waffles in Prague – are always huge hits!